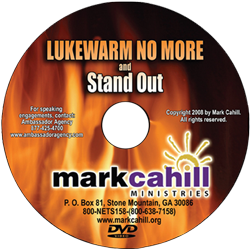 Lukewarm No More – We’ve now made a DVD of the talk I’ve been giving called “Lukewarm No More.” This message is taken from the book of Revelation, chapter 3, and is about the Laodicean church. Is it possible that you are part of a lukewarm church today? Or is it possible that you are lukewarm in your faith? Watching this DVD will make these very easy for you to figure out. After giving this talk for the first time, numerous people told me that after hearing the message, they repented of numerous things in their lives that did not line up with the Word of God. They stated how they are now living a holy life that has been completely given over to the Lord. Listen and be challenged to make sure that you never fall into the category of lukewarm ever again. Stand Out – Since we wanted to put two talks on one DVD, the second message is called “Stand Out.” It was a message that I gave to an audience of youth pastors and youth, but the message will challenge people of all ages. That message challenges us to Stand Out for the Lord in our culture wherever we are and whomever we are with. Please enjoy these messages and I do hope they will strongly encourage you to be bolder and bolder in living for the Lord Jesus Christ and reaching the lost in the coming days!